Perform smoothly on worn or new chain. Perfect for belts and roller chains with short runs where a bolt can be used as a mounting device. Choose a tensioner that will protrude a minimum 1/8" beyond each side of the chain. Use where a bolt is needed for mounting. 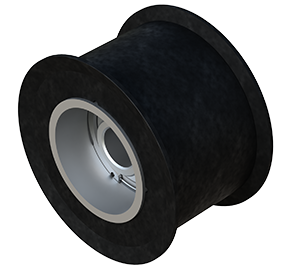 Choose this design when durable steel-flanged edges are required to hold belts and chains in place.